Sri Lanka Sotheby’s International Realty recently announced an agreement to work with Catalina Koggala, the country’s premiere villa-based residential country club, to market Catalina’s luxury villas globally. Catalina is a new luxury residential gated community development near Galle in southern Sri Lanka that commenced construction earlier this year. Targeted for completion in late 2019, Catalina will offer freehold purchase of 21 elegant villas and a five-star luxury living experience in a members-only country club setting that is unique in Sri Lanka. Sri Lanka Sotheby’s International Realty Sales and Marketing Director Charles Phillpot pointed out that currently there is a lot of interest from many countries for luxury homes in the South of Sri Lanka. “The central location of Sri Lanka and the increasing number of air routes connecting Colombo make the 1,350 miles of beaches and kind climate of Sri Lanka conveniently accessible to much of the world. The exclusive gated community of Catalina is the ideal concept for a holiday home as it offers a high level of both security and management. The Southern Expressway gives a fast road link from Colombo giving easy access to these luxury villas and their country club lifestyle,” he added. 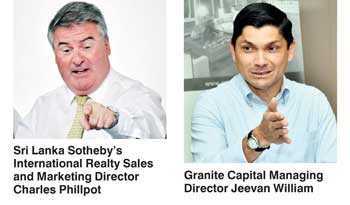 The developers of Catalina, Granite Capital Managing Director Jeevan William said they were excited to leverage the powerful Sotheby’s International Realty global marketing network and to be able to offer Catalina Koggala’s luxury villas to their exclusive clientele. The Sri Lanka Sotheby’s International Realty team comprises of real estate professionals with extensive experience in international sales and marketing and across diverse sectors of the real estate industry. It also undertakes a host of operational, marketing, and research oriented initiatives to address the requirements of the Sri Lankan property market. Sri Lanka Sotheby’s International Realty listings will be marketed on the sothebysrealty.com global website. In addition to the referral opportunities and widened exposure generated from this source, the firm’s brokers and clients benefit from an association with the Sotheby’s auction house and worldwide Sotheby’s International Realty marketing programs. Each office is independently owned and operated. The Sotheby’s International Realty network currently has more than 22,000 affiliated independent sales associates located in approximately 950 offices in 70 countries and territories worldwide. In 2017, the brand achieved a record global sales volume of $ 108 billion.